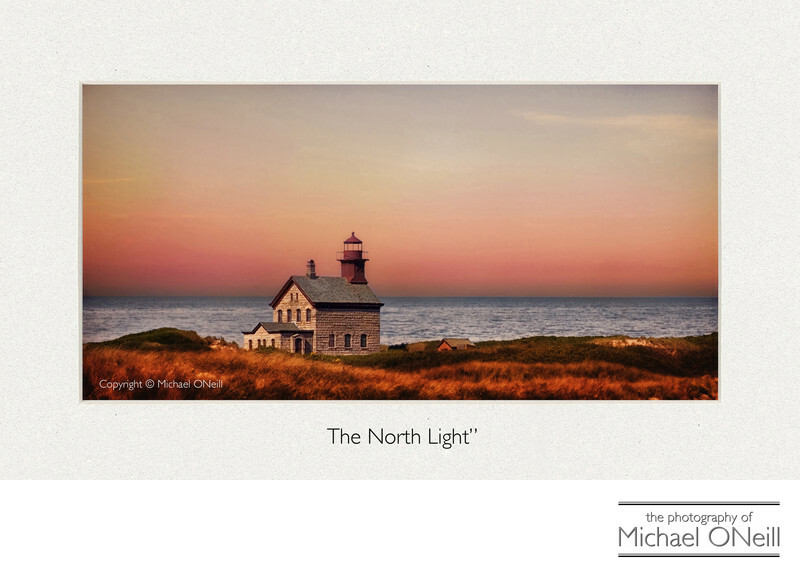 "The North Light". This image of the North Lighthouse on Block Island, Rhode Island was captured in October of 2005 during a motorcycle road trip I took through New England. Block Island sits just 16 miles off of Montauk Point, Long Island but I had never visited the place. After stopping in Point Judith, RI the night before I loaded the Harley onto the ferry and crossed the sound to Block Island. I spent the day touring the island; one of my first stops being the North Lighthouse. In the late morning hours of this clear day the lighthouse did not look very dramatic but I knew if I returned around dusk that a better image was in the offing. So with sunset approaching I made the second one mile trek of the day, in the sand, down the beach towards the structure. I made a series of exposures by the light of the setting sun and chose this one as my favorite. This picture is one of the most popular in my body of fine art photographic works. I know of at least four residents of Block Island that have this print hanging in their private collections in their homes. This image is available for acquisition through the fine art photography galleries that offer my works; and is also available artist-direct right here on my web site.